Trade deficits and surpluses typically force monetary and other economic changes in the affected countries that tend to eliminate the imbalances. The fact that many large economies have run substantial trade surpluses or deficits year after year, sometimes for decades, violates trade and economic logic; this pattern is evidence that mercantilist policy distortions, either in the surplus countries or in the deficit countries, are preventing trade from adjusting. The idea that all countries lose in a trade war is unintelligible. This cannot possibly be true, not just because there is overwhelming historical evidence that countries have benefitted from trade intervention but also because the claim is logically impossible. Whether countries benefit or lose from trade intervention depends on the underlying institutions that mediate trade and capital flows, the extent of existing trade and capital flow imbalances, and the types of intervention employed. 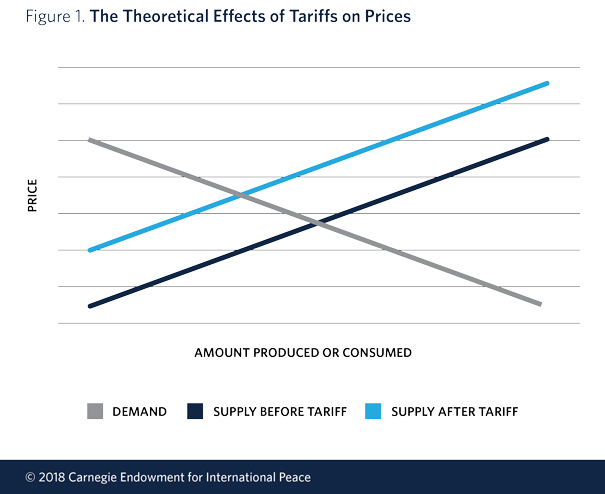 While tariffs and other forms of trade intervention may indeed raise prices for consumers, this is only one way, and often a minor way, in which these policy tools affect households. Depending on underlying conditions, they may also reduce unemployment, cause wages to rise, and reduce the growth of debt. Tariffs and currency devaluation are not the only forms of trade intervention and are not the only ways distortions are introduced into global trade and capital flows. Any policy that alters the relationship between a country’s savings and its investment affects that country’s trade balance. Tariffs and currency devaluation affect trade balances not by changing the relative prices of tradable goods but rather by shifting income from households to businesses, thus forcing up the savings rate. Because of this, any policy aimed at making an economy more competitive internationally by suppressing wages is effectively a beggar-thy-neighbor policy. Any such policy works in exactly the same way as tariffs and currency devaluation. Because the relationship between US investment and US savings is determined externally, by the country’s role in absorbing excess global savings, tariffs and other beggar-thy-neighbor policies will not reduce US trade deficits. In a globalized economy, it may be extremely difficult for any country to implement policies that protect the bargaining power of workers, that reverse income inequality, that raise minimum wages, that improve the social safety net, or that otherwise make households better off relative to businesses and governments. Implementing any of these policies causes a country’s international competitiveness to deteriorate. Consequently, rather than achieving the desired result, these policies cause the trade balance to go into deficit, and either unemployment will rise or debt must rise. To put it a little more starkly, a globalized economy must choose to protect its strength in the manufacturing and tradable sectors by lowering relative wages (directly or else indirectly in the form of tariffs, subsidies, or currency devaluation), or it must choose to boost the services and nontradable goods sectors through rapid debt growth. How do tariffs affect prices? There seems to be a basic assumption that there is a direct relationship between tariffs and the cost of goods to consumers. A 10 percent tariff on imported Chinese widgets, for instance, would be expected to raise the cost of widgets to consumers by 10 percent. It almost never happens this way. Theoretically, the tariff is supposed to cause an upward shift in the supply curve because a smaller number of widgets can be produced for any given price. The new supply curve crosses the demand curve at a higher price, but almost never at a price higher by 10 percent. Figure 1 below shows how this happens. Notice that tariffs have two adverse effects. First, the price of widgets is higher. Second, widget consumers buy and use fewer widgets than they otherwise would have. Widget consumers, in other words, are worse off in two ways: they use fewer widgets, and they must pay more for each one. But it’s clear that the ways consumers are worse off must depend on the slopes of the supply and demand curves. A lot of this reasoning is fairly obvious and is much discussed in beginning economics textbooks, so I won’t write much more about this subject, except to make one important point: every single good against which tariffs are implemented will have its own supply and demand curves, making it impossible to make any general statement about how tariffs affect prices for consumers. In some cases, they might cause prices to rise by close to 10 percent. In other instances, they will have almost no impact on prices or on quantities purchased. All of the reasoning above assumes that producer prices are fixed, but this is unlikely to be the case. In many instances, producers will respond to a tariff by lowering prices and reducing their profit margin. In such cases, the tariff is effectively paid for by producers in the form of lower profits, and consumers are able to buy as many widgets as ever at the same price as before. This tends to happen mainly with respect to high-value-added imports, in which case there is enough profit that the producer can cut prices; or in industries with large economies of scale or low marginal costs, in which producers want to protect sales volume; or in products that are considered strategically important and receive substantial direct or hidden government subsidies. How are households affected overall by tariffs and other forms of trade intervention? Most economists limit their discussions about the impact of tariffs and trade intervention to the impact on consumers. This is dishonest, or at best confused because the primary impact of tariffs (and of trade intervention, generally) is not necessarily on consumption. Countries have successfully intervened in trade for centuries; yet mainstream economists often argue, against the evidence, that trade intervention is always harmful to the intervening country because it raises consumption prices. But raising consumption prices is only one of the many ways that trade intervention can affect households. Trade intervention can also reduce unemployment, as it clearly did in the case of Germany after the Hartz labor reforms, which I discuss below. (Repressing wages, as I will show, has the same beggar-thy-neighbor impact on trade as devaluing the currency or imposing tariffs.) For similar reasons, trade intervention can affect households by allowing for domestic wage increases, as I explain in my most recent blog entry. Trade intervention can also be used to allow for high-wage growth strategies. In a February 2017 blog entry, I discuss how the so-called American System of the nineteenth century, which included substantial trade protection, was designed in part to accommodate the fact that the United States had the highest wages in the world, and that these high wages themselves were the engine of productivity growth. Trade intervention can also affect households directly or indirectly by slowing the growth in debt, whether consumer, government or corporate debt. In reverse, this was shown by peripheral Europe before the 2008–2009 financial crisis, and has been shown by the United States over the past several decades; in both cases, these countries’ need to absorb trade intervention among their trading partners required rapid growth in debt. I have explained how this works many times before (here and here, for example). The basic argument in the case of the United States is that, because of its role as the absorber of excess global savings, the country has run a permanent capital account surplus since the 1970s, which is also why it has run a permanent current account deficit since then. By definition, a capital account surplus—or its obverse, a current account deficit—means that a country’s investment must exceed savings so that net foreign capital inflows must either increase investment or reduce savings. One hundred and fifty years ago, when US investment was constrained by insufficient domestic savings, it would have increased investment, whereas today investment in advanced economies is not at all constrained by insufficient savings, so it must force down US savings. There are many ways it does so, but these can be summarized as consisting basically of either a rise in unemployment or a rise in debt. For obvious reasons, the United States has almost always chosen the latter. Limiting the discussion of the impact of US tariffs on US consumers is usually the result of either a very poor understanding of trade or a tendency to treat trade ideologically. I have often argued that US President Donald Trump’s proposed tariffs on Chinese and other foreign goods will not reduce US trade imbalances and are unlikely to be positive for the US economy. But to oppose these tariffs on the grounds that they will raise the cost of consumption is silly. That is not why they will prove ineffective. In fact, it is precisely because tariffs will have so small a net impact on the cost of consumption that they will not benefit the US economy. If tariffs could successfully reduce the US trade deficit, only then would they raise consumer costs. But in that case, even with higher consumer prices, American households would overall still be better off because they would more than makeup for higher consumer prices with lower unemployment, higher wages, less income inequality, and/or less debt. Why do countries intervene on trade? I have argued many times that one of the major weaknesses of mainstream economics is the tendency of academic economists to substitute ideology for mathematical reasoning. They do this almost any time they argue that a particular policy or condition (trade intervention, supply-side policies, demand management, or free capital flows, among others) is abstractly “good” for the economy or “bad” for the economy. The infant industry argument: This justification for protective intervention, based on Alexander Hamilton’s brilliant 1791 Report to the Congress, argues that certain industries, while internationally uncompetitive in their infant stages, can over the long run generate such rapid growth in productivity that they will eventually be able to compete internationally. In such cases, trade intervention is a strategy to allow them to survive in their early stages when they are not yet competitive. Industrial strategy: This approach is a more general version of the infant industry strategy and has been employed by governments—like the United States in the nineteenth century and China today—that want to shift a country’s economic structure in one direction or another, usually in the direction of manufacturing, high-tech sectors, or transportation. Industrial strategy often involves policies very similar to infant industry strategies and, to the extent that investment is funded domestically, it can involve policies that boost domestic savings, which I discuss below. For these reasons, industrial strategy tends to have a significant impact on generating trade imbalances, usually in the form of surpluses; that said, when an industrial strategy is funded in part by foreign capital, as it was in the United States in the nineteenth century, it results in trade deficits. Boosting domestic savings: Countries that want to raise domestic savings, or that follow what I elsewhere have called a high-savings growth strategy, have implemented policies that force up savings rates in ways that inevitably generate trade surpluses. There are many policies that force up domestic savings, but they basically all work the same way: they transfer income from ordinary households, which consume most of their income, to sectors of the economy that consume little or none of their income. I discuss these policies later in the blog post. Countering foreign trade intervention: There are often cases in which mercantilist or interventionist policies in one country create trade and capital flow imbalances that must be absorbed by another country, usually in the form of unwanted trade deficits. According to both economic and trade logic, large deficits or surpluses cannot persist over many years unless significant policy distortions keep them in place. This is because trade imbalances alter economic conditions, especially monetary conditions, in ways that automatically cause them to be reversed. In other words, to the extent that imbalances have persisted for many years, or even decades, they must be sustained by policy distortions in either the surplus or the deficit country. In such cases, if a country is forced to absorb the distortions generated by another country, and it implements trade intervention policies aimed at reversing the effects of these distortions, these policies benefit both the first country and the global economy, although usually at the expense of the country where the distortions originated. This has become an especially important argument in recent years. Distortions in the distribution of domestic income in several countries (most importantly, in China, Germany, and Japan) have led to huge savings imbalances, which are automatically absorbed by countries that have deep, flexible, and completely open capital markets with strong legal and governance institutions (mainly the United States and, to a lesser extent, the UK and other so-called Anglo-Saxon economies). The result has been that the former countries have run large, persistent surpluses for decades, while the latter have run large, persistent deficits. Policies among the trade-deficit countries aimed at reversing these imbalances can be justified as economically efficient and to the benefit of the deficit countries. Boosting international competitiveness: There are basically two paths by which government reforms can make an economy more competitive internationally. The high road is to implement reforms that enhance worker productivity. Depending on how the benefits of greater productivity are shared with workers (usually in the form of higher wages), the reforming economy might run a trade surplus or a trade deficit. Either way, the global production of goods and services increases, as does global demand. The low road is to reduce the household share of GDP in favor of producers, usually by directly or indirectly reducing wages. If a country reduces unit labor costs by lowering wages, its exporters can gain a greater global market share. Unfortunately, this strategy reduces consumption growth at home, and this effect is often exacerbated by a corresponding reduction in the growth of private sector investment (as occurred in Germany after the Hartz reforms). Nonetheless, the country implementing the reforms more than makes up for this decline in domestic demand, albeit at the expense of its trading partners, by gaining a greater share of global demand. This is a classic form of beggar-thy-neighbor policy. This means that, rather than having their desired effect, policies aimed at improving the relative position of ordinary households might only cause the trade deficit to rise, as the demand impact of higher household income flows abroad. In such cases, a country must either face higher unemployment, or it must allow debt to rise fast enough to fund employment growth in the services and nontradable sectors of the economy to make up for the loss of jobs in the manufacturing and tradable goods sectors. To put it in starker terms, a globalized economy must choose either to protect its strength in the manufacturing and tradable-goods sectors by lowering relative wages (directly or indirectly, as I explain below) or to boost the services and nontradable-goods sectors while allowing rapid growth in debt. How do tariffs affect a bilateral trade imbalance? Tariffs can have a significant impact on the bilateral trade imbalance between two affected countries if they cause a reduction in imports from one of them. For example, if China is the main producer of widgets and a 10 percent tariff on Chinese widgets causes the price of widgets in the United States to raise enough to prompt Americans to cut back sharply on widget consumption, then there would be a reduction in overall US imports from China. A tariff can also reduce the bilateral trade imbalance if it causes a shift in imports. A 10 percent tariff on Chinese widgets, for instance, might cause Chinese widget sales to collapse, to be replaced by a surge in Korean widget sales. If either of these two cases were to occur, Washington would almost certainly declare that its tariff policy was successful because it caused a significant improvement in the US trade deficit, and the policy’s proponents would point to the lower US trade deficit with China as proof. But these two ways of reducing the US deficit with China are not the same. In the first case, total US imports would decline in line with the decline in US imports from China, and the overall US trade deficit would decline as well. In the second case, the total US imports were unaffected because the lower imports from China were matched by higher imports from Korea. In this case, there would simply be a shift in the structure of the US trade deficit, but no change in the deficit itself. How tariffs affect bilateral trade imbalances, in other words, doesn’t matter, even though most economists, journalists, and policymakers will judge the success or failure of tariffs on that basis. What matters, as I will explain below, is whether or not tariffs affect the relationship between domestic savings and domestic investment. In the case of the United States, they almost certainly will not affect this relationship because it is set externally and determined by net capital flows into the United States. Do countries run trade surpluses because they produce cheaper or higher-quality goods than their trading partners? Günther Oettinger, the EU’s budget commissioner, argued that the real reason for the EU’s persistent trade surplus with the US lays simply with US consumers and their appetite for European products. “The fact that Porsche, Audi, BMW, and Mercedes-Benz, that those premium cars are selling like crazy in the US . . . has to do with design and motors, with quality. In contrast, there is no real reason to bring an American car from the US to Germany. At the beginning of the twenty-first century, Germany had been running more than a decade of trade deficits. Between 2003 and 2005, Berlin implemented what it called (a little euphemistically) the Hartz “labor reforms,” which aimed mainly at weakening German workers and reducing wages. Only after these reforms were implemented did Germany once again began to run trade surpluses, and these quickly ballooned into some of the largest trade surpluses in history. Oettinger suggested that German trade surpluses are caused by the American love of high-end auto imports, but if that were true, it is hard to explain what happened before the Hartz reforms, when Germany ran trade deficits. Apparently, Oettinger thinks that Americans had never heard of German cars until 2005. This, of course, is just silly. In fact, trade surpluses and trade deficits are not the consequence of how efficiently and cheaply countries can produce tradable goods. It is the other way around. The relative price and efficiency with which countries can produce tradable goods is determined by their trade imbalances, which are themselves determined by their relative savings rates. This is because a trade surplus (more accurately termed a current account surplus, but the difference doesn’t matter for the purposes of this discussion) is equal by definition to the excess of savings over investment. For that reason, any policy that leads savings to rise relative to investment must also result in an increase in a country’s trade surplus (or a decrease in its deficit). If, and only if, a country saves more than it invests, will it run a trade surplus. This means that even if workers did start to work harder and more efficiently, that would not result in that country running a trade surplus. It is only if the workers are not paid sufficiently for their harder work that the country would begin to run a trade surplus. But the same outcome results anyway whenever workers are paid a lower share of what they produce, whether or not they work harder. A country’s trade surplus is simply the consequence of households receiving an insufficiently high enough income to consume enough of the goods and services they produce (above the amount that is domestically invested). It has nothing to do with how efficiently those workers produce goods. Are trade surpluses the result of domestic household prudence and thrift? No, they are not. Along with the belief that trade surpluses are a reward for hard work, this is one of the most common misunderstandings about trade, and it is among the hardest to explain because the mistaken beliefs fit so well with common prejudices. How much a country saves has very little to do with cultural propensities to save. It has mainly to do with the distribution of income domestically. All income on the supply side is by definition either saved or consumed (since saving just means not consuming), just as by definition all income on the demand side is either invested or consumed. This is why, in a closed system, savings is equal by definition to investment. Whether income is consumed or saved depends largely on who receives it. It is worthwhile to think of a country consisting, broadly, of four groups: ordinary households, rich households, businesses, and governments. Ordinary households consume most of their income and save a small part of it. Rich households save most of their income and consume a small part of it. Businesses save all of their income (which they then either invest or pay out in dividends). Finally, governments consume a small part of their income (on behalf of households, for example, by providing healthcare or schooling) and save most of it. Once it becomes clear that households are not the only or even the main, source of a country’s savings, it is easy to see what determines a country’s overall savings rate. The greater the share of income that goes to ordinary households, the greater the consumption share is, and because all income that isn’t consumed is, by definition, saved, the lower the savings share is. Countries with large trade surpluses, driven by their high savings, are mainly countries in which ordinary households receive a lower share of GDP than they do in peer countries. This lower share of GDP determines the size of their trade surpluses. It is not at all a coincidence that Germany began to run surpluses just when households began to retain a smaller share of what they produced. Contrary to Oettinger’s claims, Europe is not running a surplus with the United States because Americans for the first time discovered German cars. It is running a surplus with the United States because between 2003 and 2005, to reduce domestic unemployment, Germany implemented policies that reduced the share of income German workers received and caused business profits to soar. This effectively represented a transfer of wealth from ordinary households, which consume most of their income, to German businesses and their wealthy owners, who consume very little of their income. Consequently, the German consumption share of GDP declined. Sharply declining consumption shares are, of course, the obverse of sharply rising savings shares. The Hartz reforms can be seen as a classic beggar-thy-neighbor policy that worked exactly as it is supposed to work. Rather than become more competitive by investing in productivity growth, Germany became more competitive by suppressing wage growth. As a result, Germany’s contribution to global demand declined (by the decline in the GDP share of consumption, sharply exacerbated by a decline in the GDP share of private-sector investment), but Berlin more than made up for this by taking a greater share of global demand. Germany’s soaring surpluses have nothing to do with the excellent cars Germany produces, the value of which had been well-known to Americans for decades. For those who are interested, some of my earlier discussions on the source of trade imbalances and capital flow imbalances can be found here, here, here, and here. Aren’t trade surpluses a reward for hard work and thrift? Clearly, that is not the case. Aside from the fact that surpluses are structural and the result of distortions in the way income is distributed, there is no evidence that workers in surplus countries work more and are thriftier than workers in deficit countries, something that should be easy to prove if it were true. The reasoning behind this thinking tends to be circular. When Germany ran deficits in the 1990s, German workers were widely criticized for their poor work habits. When the Hartz reforms were implemented and lower wage growth forced Germany into surplus, the same German workers whose poor work habits had been widely criticized were suddenly offered up as hard-working and prudent role models for the rest of Europe. This shift happened even though it turns out that German workers work substantially fewer hours every year than, for example, Spanish workers. To the extent that households in some countries are indeed harder-working and thriftier than those in others—not just perceived as harder-working whenever structural income distortions cause their countries to run surpluses—those households will be rewarded not by trade surpluses but rather by the ability to import increasingly cheaper goods. The prize in trade, in other words, is the ability to import foreign goods and pay for them with fewer exports. Large persistent trade surpluses simply mean that workers are paid a very low share of what they produce. If production-cost differentials don’t matter to the trade balance, how do tariffs work? Tariffs shift income between different sectors of the economy and, in this way, change a country’s savings rate. This may seem at first counterintuitive, but it turns out that this process is reasonably clear and even obvious. If Washington were to impose, for example, an effective 10 percent tariff on Chinese widgets, US households would pay more for widgets. It turns out that this would affect the relative distribution of income in the United States. Assume that many US households, perhaps all of them, would be directly or indirectly affected by the price of widgets; (if a given group of people didn’t directly buy widgets themselves, perhaps their local coffee shop would need widgets to serve them, in which case higher widget prices would be reflected in the price of their next cup of coffee). If the price of widgets were to rise, the real value of US household income would decline—Americans would be able to buy fewer goods and services, in other words, for any given level of income. On the other hand, other sectors of the economy—domestic widget producers, for example—would see the real value of their income rise. In net terms, tariffs on widgets would effectively represent a transfer of wealth from ordinary US households (consumers) to other sectors of the economy (mainly businesses and, through dividend payments, their usually wealthy owners). This transfer of wealth from a high-consuming sector of the economy to a low-consuming sector automatically forces up the savings rate, and, as discussed above, if savings rise relative to investment, a country’s trade surplus rises or its deficit declines. Why are tariffs and subsidies like currency devaluation and wage repression? As I show above, tariffs alter a country’s trade balance not by changing relative prices, as is commonly supposed, but rather by shifting income. Any policy that effectively shifts household income to another sector of the economy, or that otherwise results in a smaller household income share of GDP, ultimately has a similar impact on a country’s trade balance by raising the savings rate and altering the relationship between savings and investment. What may be surprising to many is that this dynamic is also exactly how lower wages, currency depreciation, and production subsidies (to the extent that they are ultimately paid for by transfers from the household sector) affect trade. These policies all effectively do the same thing: they improve a country’s so-called competitiveness by forcing down the real value of wages, which, in turn, reduces the household income share of GDP. As the share of GDP retained by ordinary households declines, the consumption share automatically falls too, which means, of course, that the savings share of GDP rises. If it rises relative to investment, it immediately causes an improvement in the trade balance. In fact, this is one of the more conventionally surprising implications of trade analysis: in the end, imposing tariffs is no different than devaluing a currency or forcing down wages. And in economies for which investment is not constrained by low savings, all three methods are beggar-thy-neighbor trade policies that are done for the same reasons—to increase business profits and to reduce unemployment. These policies also have the same effects on trade partners: they weaken overall demand in the global economy by reducing the consumption share of GDP in the country that implements the policies. Consequently, that country benefits at the expense of its trading partners because that country’s policy choices allow it, through a greater trade surplus, to gain a larger share of remaining global demand. Doesn’t that mean that tariffs always “work” to improve a trade imbalance? No, it does not, and that is why it is important to understand how tariffs (or depressed wages or a devalued currency) actually affect trade balances. When one assumes that they work by altering relative costs—by making imports more expensive relative to domestically produced goods—than it is pretty easy to understand why they are likely to be successful. A 10 percent tariff on imported widgets would cause the price of foreign widgets to rise relative to domestically produced widgets, causing Americans to import fewer widgets and reducing the US trade deficit. But because tariffs only affect the trade balance to the extent that they alter the relationship between domestic savings and domestic investment, they work in some cases but don’t work in others. In the United States, it turns out, tariffs are unlikely to have an effect on the trade deficit because the relationship between domestic savings and domestic investment is determined not by domestic savings preferences but rather by foreign capital inflows. These foreign capital inflows are themselves determined by the need for foreigners to park their excess savings in a safe haven. I have discussed the reasons for this in the blog entries cited above. Why are these beggar-thy-neighbor trade policies only in economies in which investment is not constrained by low savings? Remember that imposing tariffs, devaluing a currency, and forcing down wages all have the same impact: all these methods transfer income from ordinary households, whether to businesses in the protected sector and to their wealthy owners (if tariffs are imposed), to the tradable goods sector (if the currency is devalued), or to labor-intensive businesses and the wealthy (if wages are repressed). In each case, income is transferred from the sector of the economy that consumes the highest share of its income and saves the lowest share to sectors that consume little or none of their income and save most or all of it. The net effect is an increase in the desired savings rate. But savings don’t necessarily rise in every case. Because savings must equal investment in a closed economy, savings can only rise if investment rises; otherwise, some other event must occur that neutralizes the impact on savings that was set off by the shift in income from households to businesses and the wealthy. In developing countries where desired investment levels are much higher than actual investment levels but constrained by high capital costs and the low availability of savings (most developing countries with the exception, mainly, of China), investment does rise. By transferring income from consumers to savers, these policies all result in higher investment, and the economy benefits from higher growth. Even though households suffer, their suffering is only temporary because of the consequent increase in economic growth means that eventually, they will earn more than they otherwise would have. This, in effect, is how trickle-down economics is supposed to work. The decline in demand must cause unemployment to rise, which leads savings to decline (since unemployed people have negative savings) by enough to neutralize the increase in savings caused by the shift in income. The decline in demand must be reversed by an increase in debt, which boosts demand and causes savings to decline (as debt is negative savings) by enough to neutralize the increase in savings caused by the shift in income. The excess savings must be exported, which means the country will run a trade surplus. The third option, by the way, is not available to the United States or to other economies with very deep, open, and liquid capital markets and strong legal and governance institutions (like the UK and other Anglo-Saxon economies). That is because these economies do not control their capital accounts, and for this reason, they in effect operate like closed economies. Since the 1970s, when excess global savings first became a problem, roughly 40–50 percent of the world’s excess savings have been parked in the United States. As a result, the United States has always run a capital account surplus that it cannot control and a corresponding current account deficit. This means that US investment must always exceed US savings by the amount at any point in time of net capital inflows. One important, and perhaps surprising, implication is that the United States cannot engage in beggar-thy-neighbor policies because it cannot run a trade surplus. In fact, as long as its capital markets remain wholly open, it cannot even take steps to reduce its trade deficit except by making it harder, or less attractive, for investors to bring money into the United States. Because the US trade deficit is set wholly by the net amount of excess foreign savings it has to absorb, it is not able to alter its overall savings rate.